(DES MOINES) - For about 35 minutes, it felt like Bradley might pull off the first bracket-busting stunner of this year's NCAA Tournament. Michigan State survived by leaning on the brilliance of Cassius Winston and a remarkably efficient performance at the free throw line. 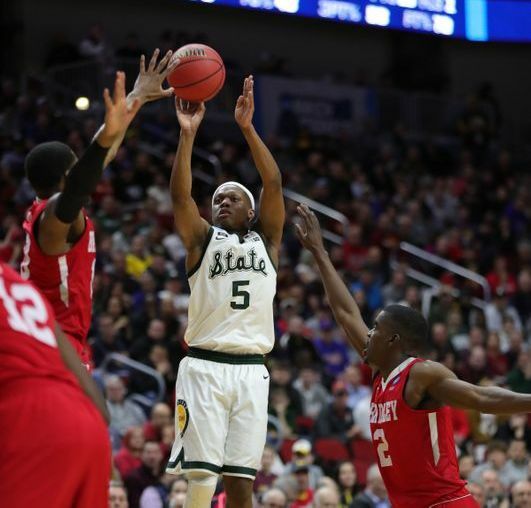 Winston scored 26 points and second-seeded Michigan State, thanks in part to a season-high, 25-of-26 showing from the line, held off Bradley 76-65 on Thursday in the opening round of the East Region. Xaiver Tillman had 16 points with 11 boards for the Spartans (29-6), who'll face Big Ten rival, 10th-seeded Minnesota, on Saturday in search of their first trip to the Sweet 16 in four years. Bradley (20-15) gave the Big Ten champions all they could handle, though. It was a one-possession game until Matt McQuaid drilled a crucial 3 to put Michigan State ahead 61-55 with 3:31 left. Aaron Henry followed with a layup to cap a 9-0 run. Elijah Childs scored 19 points and Darrell Brown had 17 for the Braves, who went just 3 of 12 from beyond the arc in the second half.